Some new books have arrived just in time for fall! 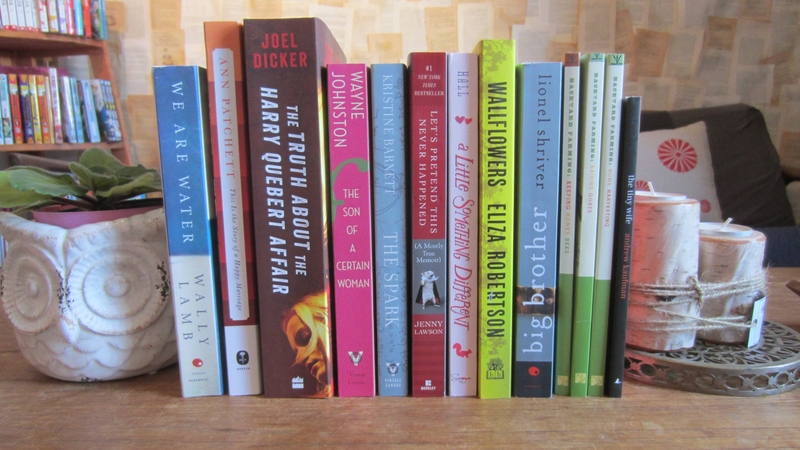 The new titles are listed here, but we have also received some reorders of Backbeat best-sellers that aren’t pictured. – “We Are Water” by Wally Lamb – now in paperback! Thirty-three years later, Marcus Goldman, a successful young novelist, visits Somerset to see his mentor, Harry Quebert, one of America’s most respected writers, and to find a cure for his writer’s block as his publisher’s deadline looms. But Marcus’s plans are violently upended when Harry is suddenly and sensationally implicated in the cold-case murder of Nola Kellergan—whom, he admits, he had an affair with. As the national media convicts Harry, Marcus launches his own investigation, following a trail of clues through his mentor’s books, the backwoods and isolated beaches of New Hampshire, and the hidden history of Somerset’s citizens and the man they hold most dear. To save Harry, his writing career, and eventually even himself, Marcus must answer three questions, all of which are mysteriously connected: Who killed Nola Kellergan? What happened one misty morning in Somerset in the summer of 1975? And how do you write a successful and true novel? A global phenomenon, with sales approaching a million copies in France alone and rights sold in more than thirty countries, The Truth About the Harry Quebert Affair is a fast-paced, tightly plotted, cinematic literary thriller, and an ingenious book within a book, by a dazzling young writer. Percy, Penelope, and Pops live in the Mount, home of the city’s Catholic schools and most of its clerics, none of whom are overly fond of the scandalous Joyces despite the seemingly benign protection of the Archbishop of Newfoundland himself, whose chief goal is to bring “little Percy Joyce” into the bosom of the Church by whatever means necessary. In pursuit of that goal, Brother McHugh, head of Percy’s school, sets out to uncover the truth behind what he senses to be the complicated relationships of the Joyce household. And indeed there are dark secrets to be kept hidden: Pops is in love with Penelope, but Penelope and Medina are also in love—an illegal relationship: if caught, they will be sent to the Mental, and Percy, already an outcast of society, will be left without a family. In the opening story of Wallflowers, a girl is cat-sitting for her neighbor, sleeping in the neighbor’s house. It’s nearly identical to her mother’s nearby—in the Copper Waters subdivision, they all are—but she likes it here, eating boiled eggs and watching TV, feeling out her freedom as heavy rains fall. And then a nearby dike fails. And the girl may be the only one left in Copper Waters. Eliza Robertson can handle the shocking turn, but she also has a knack for the slow surprise, the realization that settles around you like snow. Her stories are deftly constructed and their perspectives—often those of the loners and onlookers, distanced by their gifts of observation—are unexpected. In “We Walked on Water,” winner of the Commonwealth Short Story Prize, a brother and sister train together for a race that will ultimately separate them forever. In “L’Étranger,” shortlisted for the CBC Short Story Prize, a girl abroad in Marseille reconsiders her unendearing roommate after an intimate confrontation. Robertson was raised on rugged Vancouver Island. She’s traveled broadly since, and her stories travel, too, but the climate of her collection is influenced by her home. These carefully cultivated forms still flare with wildness, and each is still spacious enough for a reader to get lost in wonder. – “Big Brother” by Lionel Shriver – now in paperback! For Pandora, cooking is a form of love. Alas, her husband, Fletcher, a self-employed high-end cabinetmaker, now spurns the “toxic” dishes that he’d savored through their courtship, and devotes hours each day to manic cycling. Then, when Pandora picks up her older brother Edison at the airport, she doesn’t recognize him. In the years since they’ve seen one another, the once slim, hip New York jazz pianist has gained hundreds of pounds. What happened? After Edison has more than overstayed his welcome, Fletcher delivers his wife an ultimatum: It’s him or me. Make beekeeping a part of your backyard farming experience: enjoy honey, beeswax and a more fruitful garden, as your bees will work as hard as you do to make your backyard farm a success! Backyard Farming: Keeping Honey Bees is your guide to successfully caring for your hive. As a comprehensive primer for first-time beekeepers, Keeping Honey Bees includes detailed illustrations and informative photographs that help to ease new homesteaders into the world of backyard beekeeping. Keeping Honey Bees takes you from start to finish: from planning out your bees’ space in the yard and constructing/installing your hives, to feeding and nurturing your new colony, to enjoying your very own golden honey and more. …and many more tips and tricks from experienced farmers to help you avoid the most common pitfalls you might encounter. Keeping Honey Bees is your first big step to joining the growing movement of homemakers and homesteaders looking to make a return to a healthier, happier way of life—and it starts right in your own backyard. Backyard Farming: Raising Goats is the ideal resource for the new farmer just starting out, providing a comprehensive guide for preparing and caring for the addition of goats to your backyard farm! Backyard Farming: Raising Goats is the perfect guide for beginners thinking about including goats to their sustainable homestead. Covering every topic from selecting and maintaining a breed, to the tools and space you’ll need, to all the wonderful benefits that owning goats can provide, Backyard Farming: Raising Goats includes all that you need to know to get the most out of your new herd. Including time-tested tips and tricks used by expert farmers, this invaluable resource is a must-have for anyone looking to raise goats at home! Everything you need to get started. Covering topics from selecting the perfect breed for your space and time requirements, to milking and culling your herd, to preparing for and raising the next generation of kids, Backyard Farming: Raising Goats is the all-in-one guide for the aspiring home goatherd. Easy to follow, easy to understand. Written in simple, informative language, complete with numerous illustrations of proper techniques and housing set-ups, Backyard Farming: Raising Goats is written with first-time goatherds in mind. A great addition to any backyard farm. The benefits of owning goats range widely: goat’s milk, meat, even goat hair has its uses and markets. Easier to care for than sheep and lots of fun besides, Backyard Farming: Raising Goats is the perfect first step to adding livestock to your farming experience. Backyard Farming: Home Harvesting is the ideal resource for the new farmer looking to make the most of his produce by preserving it for the future! Providing a comprehensive guide for preparing and preserving your hard-earned harvest, this book ensures that your backyard farm will feed you all year long! Backyard Farming: Home Harvesting is the perfect guide for beginners looking to extend the benefits of their homestead’s produce. Covering every topic from selecting and maintaining the resources needed to properly preserve your food, to the various methods of preserving and how they are done, to recipes and ideas for making the best use of your preserved bounty, Backyard Farming: Home Harvesting includes all that you need to know to get the most out of your home harvest. Including time-tested tips and tricks used by expert farmers, this invaluable resource is a must-have for anyone looking to enjoy the fruits of their labor year round! Everything you need to get started. Addressing all the important areas, from selecting the ideal method for your crop, to knowing when and why to preserve, to how long each method preserves your food for, Backyard Farming: Home Harvesting is the all-in-one guide for the first-time farmer at harvest time. Easy to follow, easy to understand. Written in simple, informative language, complete with numerous illustrations of proper techniques and preserving set-ups, Backyard Farming: Home Harvesting is written with new farmers in mind. A guide that every backyard farmer can use. Whether your backyard farm raises livestock or grows crops, there is a method in this book to greatly extend your enjoyment of your harvest! From canning, to smoking; from freezing to drying, the benefits of preserving are obvious! No farmer wants to have to throw away their hard work, and Backyard Farming: Home Harvesting is the perfect guide to ensuring that no part of the harvest is wasted. What book are you most looking forward to reading this fall?